Domenic Bonavita has a strong business mind and tenacious work ethic that has led to more than 25 years of industry success. Genuine, approachable and extremely dedicated to exceeding every client's expectations. Domenic has a varied and dynamic clientele and prides himself on absolute professionalism and commitment in finding innovative ways to achieve the best possible result. He is constantly striving to secure new opportunities in the market with a proactive approach that sets him apart. Domenic has an innate ability to understand both a vendor and buyer's needs and prides himself on being able to successfully interpret their goals into a result that exceeds expectations. Domenic is a proven achiever, known for being highly professional with a powerful, result driven approach. Combined with his proactive attitude and outstanding attention to detail, you can be sure that Domenic will go the extra mile to ensure all his clients receive stellar results. 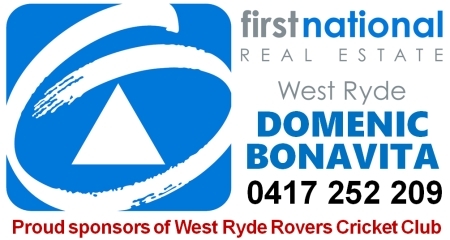 Domenic has sponsored West Ryde Rovers Cricket Club since 2016, and his logo appears on all Under 8 and Under 9 playing shirts.